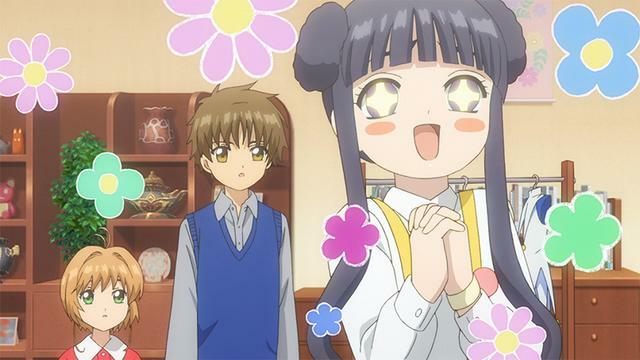 Tomoyo measures Syaoran for a costume she is designing for him, she plans on make both Sakura and Syaoran “look beautiful.” Sakura and Tomoyo run into Akiho on their way to school, she tells them about the home she staying in. She say’s that ” a boy her age, who came here from England, lived in it before me.” Sakura asks to see a picture and realizes that it’s Eriol’s old house. 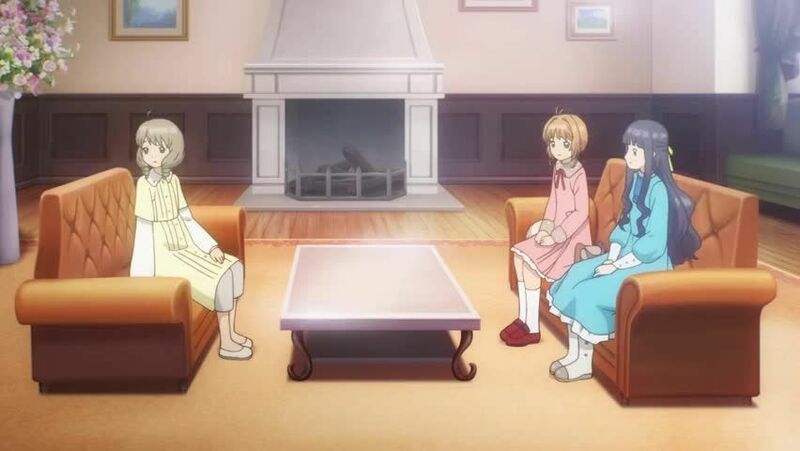 Akiho tells them about her time in England. Sakura tells Syaoran that Akiho invited her to visit her on Sunday. 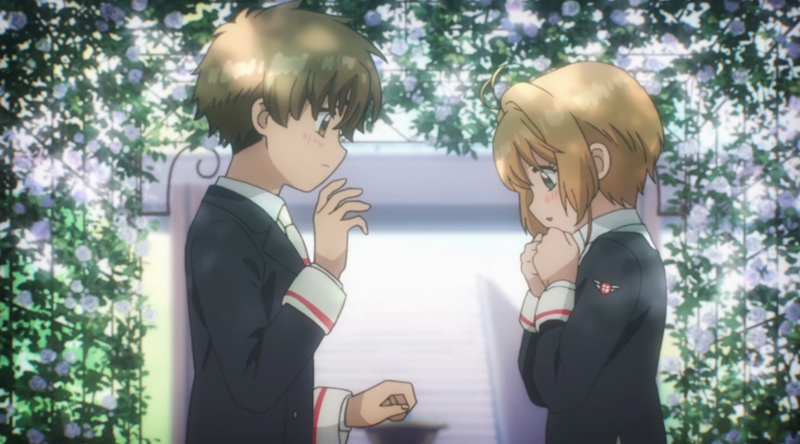 Sakura then asks Syaoran on a date the following Sunday, it’s a very cute moment between them even though Kero interrupts this moment inviting himself. At home Sakura has another vision of the cloaked figure, she asks him what’s he’s wants from her. Kero wakes her up on the floor, the next day they arrive at Akiho’s house. 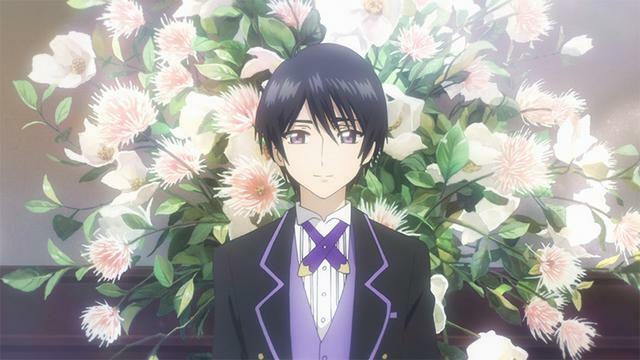 They’re introduced to Akiho’s butler, Yuna D. Kaito, the house is arranged differently from when Eriol lived there. Yuna arrives with cherry blossom flavored tea, and cake, Sakura makes a funny face and Kero asks for a piece. She sneaks him a piece and it appears that Akiho may have seen it. After cake she shows them her families library. Her family loves to read and collects books from all over the world. She says that “she came to Japan for a book,” as she speaks Sakura senses a card. Tomoyo and Sakura walk through the library and notice that some books are missing. The books and shelf seemed to have disappear, however, they are just invisible. Sakura releases her staff, their’s not any battle, Sakura secures the Lucid card. Akiho arrives with a book entitled, “Alice in Clock Land.” The covers clock design reminds Sakura of her vision, the book is in another language but Akiho states that she can read some of the book. Meanwhile in England, Ruby believes that they must return to Japan to aid Sakura. However, Eriol says that “it’s not the time for them to interfere.” Despite that lack of a more action packed card capture, this episode was enjoyable. I get the impression that Akiho has more to offer the story than this episode let’s on.